The Bottom Line: A simmering crime thriller with an explosive payoff. 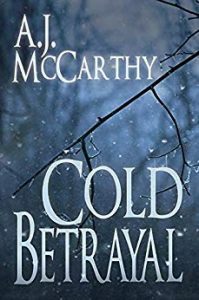 As Cold Betrayal opens on a wintry day in the Quebec wilderness, 29-year-old Florida native Tori Anderson finds herself at death’s door. After surviving a car crash, a dog attack and a plunge into an icy lake, she is rescued by a seemingly benevolent ice fisherman named Ben. While it’s quickly apparent that she is wearing stolen clothes from Ben’s cabin, he doesn’t let her die of hypothermia, nor does he call the police. After settling her in with some food, warm clothes and a bed, he naturally wants answers. Who is Tori and what is she doing so far from home? Is someone chasing her, or is she the one on the hunt? Despite Ben’s kindness, Tori remains as tight as a drum. Only one thing is clear: she fears for her life. Author A.J. McCarthy keeps the narrative tension high by weaving pieces of the mystery in slowly, like flecks of gold from a river. Even Tori’s identity and her mission are formed in fragments over the course of the first half of the book. McCarthy is a patient storyteller and asks for the same from her readers. It takes several chapters before readers will understand whether Tori is a force for good or evil, to say nothing of the person she is most loyal to. Those that stay in for the ride will be rewarded with an explosive payoff.